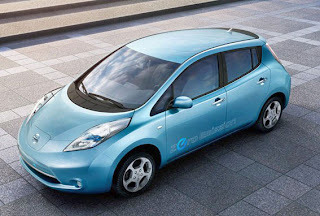 Nissan Motor Co. reported this week that it has reached its goal of 20,000 U.S. pre-orders for the Leaf EV - three months ahead of schedule - and has temporarily stopped taking new reservations. "We have completed the first phase of reservations," the company said on its Leaf Website. "In order to provide the best level of customer service and premium ownership experience to the first Nissan Leaf drivers, we will not be accepting new reservations until the next phase begins." The next phase of new reservations will begin next year, after current reservations and orders have been processed. Pre-orders, which required a $99 deposit, first became available in April. Not everyone who reserved a Leaf will actually buy one, but it's certainly an encouraging sign for the $32,780 all-electric vehicle, which goes on sale in select U.S. markets later this year. The plug-in model, with a travel range of about 80-120 miles per charge, will be available for sale throughout the U.S. by the end of 2011. It will also be available for lease at $349 per month.